No Use. No Lose. Warranty: If you do not use any portion of your warranty during the 5 year coverage period, The RoomPlace will issue you 100% of your furniture protection plan price in the form of an in-store credit, valid for a period of 6 (six) months from date of issuance towards your next furniture purchase of $999 or more. To qualify, complete the following information and mail this postcard within 90 days after your warranty expiration date. Postcards that do not include the order number and are not received within 90 days prior to the expiration date of the warranty do not qualify. Your requests will be processed and you will receive notification via e-mail within 30 days of the postmarked date. Postcards received prior to the expiration date of the warranty will not qualify. 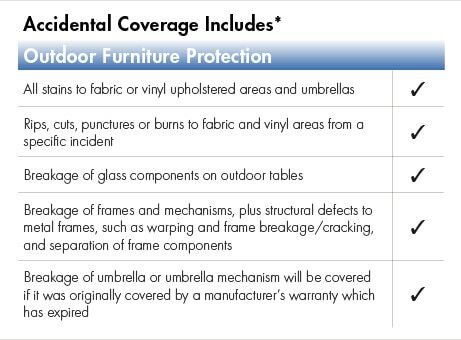 We offer protection plans that will protect your furniture for years to come! When you click "Proceed to Checkout" from you theroomplace.com Shopping Cart, you'll arrive at the first step of our easy-to-use order process. If you have items in your order that can be protected, you'll see additional information and pricing. 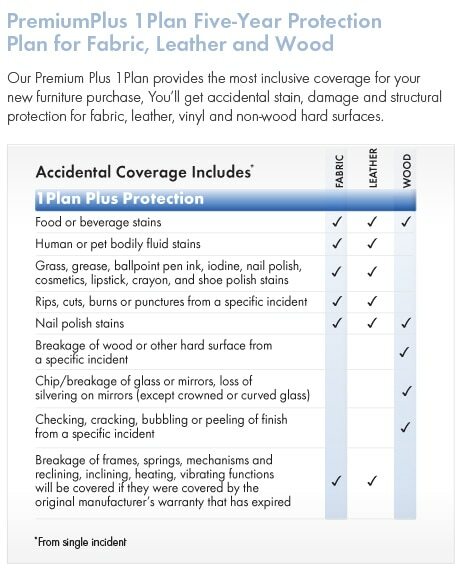 Click "apply" and your furniture will be protected from common accidental household stains and damage. Our Guardian Furniture Protection Program is administered by Guardian Protection Products. Visit the Guardian website at www.guardianproducts.com for more information. You can also find out more about Guardian’s high performance furniture care products at www.guardianproducts.com. Contact Guardian directly at 1-800-527-8485 within 30 days of discovery. Please have your sales order number available to identify your plan when filling a service request. Guardian will assist you with cleaning, repair or replacement of your protected furniture. *Some exclusions apply. See protection plan terms and conditions for details. Protection plans provided by CNA Warranty Service, Inc. or one of its affiliates, and administered by Guardian Protection Products Inc.